Gilbert was friendly and professional. Inspection and maintenance was done in 1 hour. No appointment necessary so that was a plus! I liked that my expired coupon was honored. Service was courteous, friendly and professional, when I handed in a discount offer after the bill was made, Diana had no problem redoing the bill. It was very quickly. I appreciate her service. This is an excellent service center! I would highly recommend them to everybody who needs to get their vehicle serviced! Matthew Delbene is an absolute professional! Excellent customer service. No hassles or beating around the bush. I will definitely be doing business again at Pepe INFINITI. Really enjoying my new 2019 INFINITI QX60 PURE AWD. Pepe INFINITI is committed to providing our customers with the highest level of service and integrity in every department of our dealership. We pride ourselves on developing a personal relationship with each and every customer so that our dealership will be your “Automobile Source” for life. 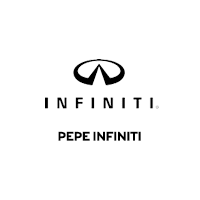 Pepe INFINITI is committed to your vehicle purchase satisfaction. Whether you’re looking for a new or pre-owned INFINITI, a luxury import, sport utility or a second family car we can help. Our sales staff is also dedicated to helping you choose just the right financing program option, whether it be purchase or lease.